Guests often comment that our home exceeded their expectations. It's probably because of all the local materials and the attention to detail. There are local hard-wood floors throughout (even the bathrooms and kitchen), custom stained glass windows, granite counter tops, and lots of original artwork. There's also an outdoor shower, two beach cruiser bikes and two mountain bikes, Instant access Netflix Movies and unlimited music from Pandora on the TV, purified (by reverse osmosis) drinking water, your own water well with whole house ultra violet filtration system (no worries about running out of water or other problems association with 'catchment systems' that are common in our area), solar-heated hot water, a solar-heated pool, various board games, some good Hawaiiana books, various floaty pool toys, and plenty of etc. All this on a 1/2 acre property. A comfortable king sized bed with soft cotton sheets, vintage rattan reading chairs, vintage mango wood dresser, ceiling fan, and 2 bed side tables both with reading lamps. The direct ocean view from the bedroom also allows for great breezes. The wide balcony is directly in front of both upstairs bedrooms. A comfortable queen sized bed also with soft cotton sheets, writing desk and chair that faces the ocean, 2 bed-side tables with reading lamps, ceiling fan, and a dresser make this a fully functional room with that same huge ocean view. The bathroom is accessed by both bedrooms. It has a tub/shower and sink/vanity in one room, and a separate room for the toilet. Shampoo, hair conditioner, hand soap, TP, and plenty of towels are all provided. A comfortable queen sized bed, with good cotton sheets, a small closet with shelf for luggage, ceiling fan, chair, luggage stand, a free-form mango-wood built-in table and 2 reading lights. This room is set back from the front of the house but still has an incredible ocean view. It also has 2 intriguing stained glass windows -- 1 depicting Kilauea Volcano, the other a humpback whale breaching. Breathtaking when the light hits it just right. Tub/shower, vanity and sink, toilet, and incredible large stained glass window depicting a Polynesian voyaging canoe and a variety of wildlife. Again, shampoo, hair conditioner, hand soap, and TP are all provided. The living room is decorated with a vintage Hawaiian comfort, yet with modern updates -- DISH TV, Pandora, Wi-Fi. There is also quite a bit of original artwork. There's a full sized dining table with 6 chairs, as well as 4 bar chairs. The kitchen is fully stocked -- espresso machine, regular coffee maker, toaster, blender, microwave, and plenty of dishes, silverware, cookware, and all things needed for cooking your healthy meals at home. The Barbecue (propane) is just outside--Fresh Fish is always good cooked on a BBQ. STAIRS: The upstairs is accessed via stairs which start near the front door and are on the outside of the house. We like this because we see the ocean and the stars at night. It also keeps the upstairs bedrooms more private. The triple filtered drinking water is a big bonus. Many houses in our area use 'catchment' systems, catching water off their roof. There are good filter systems, and there are less-than-good filter systems. We have an excellent reverse osmosis system that actually purifies your drinking water. FYI, wherever you decide to stay in East Hawaii you should ask about their water system. HUMPBACK WHALES -- WOW, THEY CAN BE CLOSE. In front of our home, the ocean gets deep quickly. Because of this, their birthing and mating months (December - April) are excellent times for hearing humpback whales at night, and of course seeing them by day. Their tail slapping can wake you up--no kidding. Our home is fully functional, clean, comfortable, AND in a great location. In short, it is 'homey'. 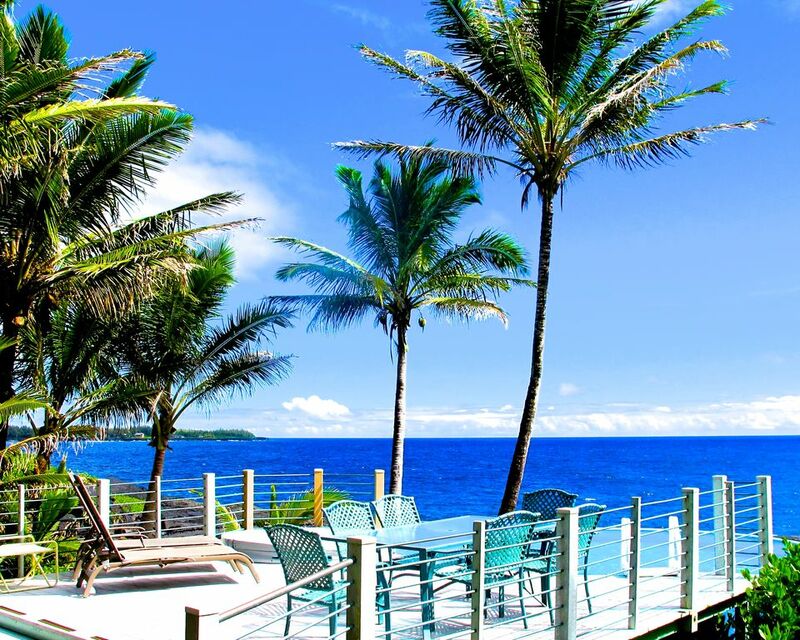 You will be only 25-30 minutes from Hilo Airport, a few minutes more to Downtown, Bayfront or Richardson's Beach and 20 minutes from Pahoa, a Great/Funky Restaurant town. You will be 30 minutes from the warm ponds at Ahalanui and the Marine Sanctuary where you can snorkel with tame good-sized schools of fish! You're also 45 minutes to Volcanoes National Park (location of the historical Kilauea Caldera, and home of Pele the fire goddess) and 45 minutes away, in the other direction, from the Ocean Entry for Flowing Lava. This is subject to change of course, but has been amazingly steady of late. If you're looking for a comfortable, spacious, truly OCEANFRONT home, retreat, and a base of operations, this is it. This is the house that Jack built, in 1998. First camping out in the would-be garage, then creating an artistic retreat/bachelor pad, and ultimately a great family home. We happily lived here for many years. The ocean is mesmerizing by day, lulling to deep sleep at night. The ocean-side deck with spa and swimming pool will become your outdoor living room. The neighborhood is nice and friendly and you can walk or ride bikes for miles along the coast in either direction. Or you can hang out. You just might not want to leave. •	Within 90 days: You will receive your deposit, minus $100 service fee, and less any credit card fees. •	Less than 90 days: You will forfeit your deposit. However, we will always work to re-book. If we can re-book, we will refund based on 80% of the nightly rate for the nights we have re-booked, less $100 cancellation fee and less any credit card fees. •	VRBO sometimes has blanket statements about refunds, which are not accurate for our property. We tend to be more accommodating than their options, though we do have a small cancellation fee of $100. Our cancellation policy is fully explained in an attachment and summarized here. •	Thank you for understanding. Also: To be in compliance with Hawaii State Law (Act 204 Session Laws Hawaii State Legislature, 2015) our Hawaii Transient Accommodations Tax I. D. No. is TA-116-308-1728-01. english, Just enough French to have a funny conversation. Here we are checking out the lava flow. We have lived in East Hawai`i for over 30 years, so we obviously love Hawai`i. Jack is a 3rd generation Hardwood Flooring Contractor, newly retired, and Barbara is a jaquette of all trades, most recently working for the County of Hawai`i. East Hawaii is varied, and exciting; the volcano never ceases to inspire and thrill. Madame Pele gives her unique energy to the whole of East Hawaii, and especially the Puna District. We have lived in East Hawaii for so long, and this house was our home, until we moved to the Big City of Hilo. Jack built this home in 1998, after living a few blocks away for about 15 years. We have completed a major re-fresh in Fall, 2013, and seem to always be cleaning, upgrading, or doing maintenance on something. The house is definitely in good order. Because our home is almost at the end of a quiet dead-end street, it is very restful and private. We like to find new spots, via bicycle, or hiking boots, or swimming fins. There are so many incredible places to explore and we never get tired of adventuring. We like to walk or bike the coastline--for miles. To the south, we go to some tidepools about 1 1/2 miles away. To the north, we bike, then hike the last bit to a white sand beach that's about 5 miles away. When we are here, if we're not doing maintenance stuff, we also spend many hours lounging back and forth between the hot tub, the solar heated pool (90-95 degrees F), and lazing around on the deck. It's so private and quiet--we love it. toilet, combination tub/shower, UPSTAIRS. Shared between 2 bedrooms. Separate toilet room. toilet, combination tub/shower, DOWNSTAIRS. Wonderful stained glass too. outdoor shower, Out by the pool, very convenient. The upstairs bathroom is accessed by both bedrooms. There is a separate 'toilet room'. Yes, VERY near. You can feel it in fact. It is a nice feeling of having some neighbors, but also a lot of space to enjoy nature. Pahoa, about 8 miles away, is an old logging town gone hip. You'll have to decide for yourself how to describe Pahoa. It does have quite a few good restaurants. Keaau is about 10 miles away. Mauna Loa view from the cliff in front of the house. HUGE ocean view from every bedroom, living room & kitchen. Hear comforting sound of waves hitting the cliff which lulls you to sleep at night and provides endless entertainment by day. The drop to the ocean is about 25 feet and it's possible to see Green Sea Turtles or other fish swimming in the super clear water. Pretty fantastic. You can also fish here, though you'll need to bring your own gear. Hard to escape from the ocean view. Private phone line with FREE long-distance calls to the US and Canada. Sheets are all 100% cotton, 200 thread count, or higher. Towels are sufficiently thirsty and kitchen towels are plentiful. Even cloth napkins for this reasonably green home. Washer and Dryer are conveniently located in the garage. You are welcome to use them. Laundry soap is provided. Yes indeed, right next to the washing machine. Yes. Functions as a giant mud room and staging area for sports and activities--very convenient. It also works as a car garage. Wi-Fi. Password is given at check-in. It is in the 'house book' with LOTS of other information. Nice bath towels and large-sized towels for the pool. Does nature count as a room? Pool for doing aqua aerobics, bikes for long rides. Some snorkel gear for adventures in the ocean. YES. We hope you can use it for planning & fun, rather than work! The network name and password are in the 'house book'. A great room with vintage rattan furniture, dining area, the punee (day-bed), TV, Hawaiiana library (as well as various novels) and the kitchen. Very quiet. No need to time its operations because it might interfere with other fun. Good-sized and quiet, in case you're expecting to have someone sleeping on the great room futon-bed. Gas (propane in Hawaii) stove top, with 4 burners, and full-sized oven. In combination with the gas range top. Easy to use for left-overs or popcorn or whatever you desire. 3 versions of Coffee Makers. 1. A regular 'Mr. Coffee' style coffee maker. 2. A french press. 3. Even a fancy espresso machine! And a coffee grinder for checking out the local beans. There are usually some condiments, balsamic vinegar and oil. You'll need to check though. Plenty of all the basics. Plenty of plates, glasses, flatware. Good-sized dining table in the great room with 6 chairs. And, 4 chairs at the counter-height bar. There is also an outdoor table on the deck with 6 chairs. Roku for Netflix and Pandora. Also basic Dish TV channels. Dish TV (basic stations) and Roku TV (connects to wi-fi, for Netflix account and Pandora, as well as other pre-programmed stations). CD player and a decent small sound system. Many books -- Hawaiiana and novels. You can while away quite a bit of time here. Quite a few board games. We have some popular or interesting DVDs. Also, about 10 board games and a variety of novels as well as some really good Hawaiiana resource books. You can throw a frisbee around, or otherwise feel like you have some space. UPSTAIRS. In front of both bedrooms is the large lanai/balcony. You can rent kayaks or SUPs (stand-up paddleboards) in Hilo, presumably to use in Hilo Bay. 2 aluminum beach cruisers (one speed) and 2 mountain bikes with multiple speeds. DOWNSTAIRS. Next to the pool and hot tub, right outside the house. It affords a great view of the coastline both north and south. It may become your favorite 'room' at the house. Hilo or Volcano are the closest courses. Though the house was not specifically built to be wheelchair accessible, the first floor has only one door threshold from the garage, and the door is wide. The bathroom door is 30' wide, and the bedroom is on the same level. Our elderly family really like the downstairs bedroom/bathroom because they are convenient and beautiful. They get the full experience of the house, and the ocean, even if they never go upstairs. Ask for more particulars if you need true accessibility. THE POOL IS HEATED (as of 2014)! There is solar heating for the swimming pool. It's fun. And there are a few floaty toys! It is on average 5-8 F degrees warmer than the ocean temperatures. View the stars at night, or whales in season, in a really private setting. Also, no matter what the weather delivers, this has the view! TWO BEACH CRUISER BICYCLES (one speed, aluminum, easy and fun.) and TWO GEARED BICYCLES, DISH TV, all cotton (soft) linens, iron, ironing board, hair dryer, stainless cookware, all utensils, Gas BBQ, garage parking, some pool toys, small DVD collection, Hawaiiana and other books, and Humuhumunukunukuapua`a (Present State fish of Hawai`i, could lose its status soon) go swimming by, Sorry no pets or smoking inside allowed. SUPPLIES: You can count on Shampoo, Conditioner, and Hand Soap in the bathrooms as well as Household Soaps, where needed, for: Laundry, Dishwasher, and Dishes. All the relaxing or adventurous activities you can dream of, Volcano viewing, warm pond soaking, sea-life viewing/hearing and every once in a while smelling, Especially wonderful for mind-clearing, adventuring, bike riding, walking, and a close-by great Sunday Farmer's Market -- Maku`u Market.